For Canadian hockey fans, the World Juniors are a big deal. A really big deal. 2014 Upper Deck Team Canada Juniors Hockey brings the young national team back to the hobby for the first time in several years. Every box comes with six total autographs, memorabilia cards and printing plates. Of those, one is an autographed patch card and another is a multi-swatch memorabilia card. 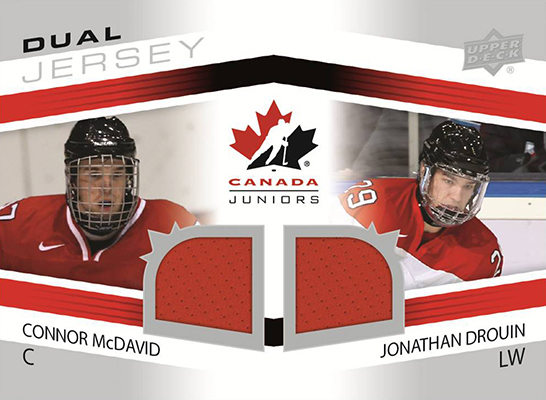 2014 Upper Deck Team Canada Juniors Hockey is the first set from the company to include cards of several high-profile prospects like Connor McDavid, Sam Reinhart, Aaron Ekblad and Jonathan Drouin. In addition to top men's players, members of the women's team are also in the product. 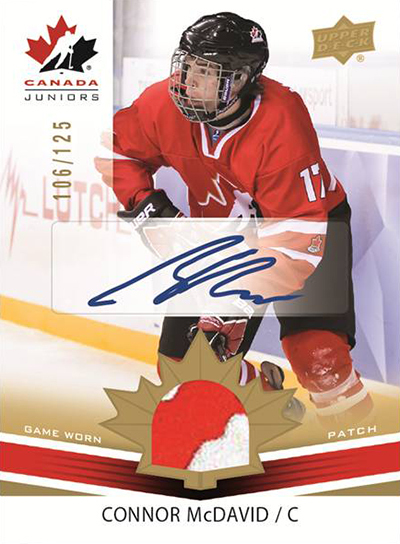 The 2014 Upper Deck Team Canada Juniors Hockey set has 100 cards. On top of these are 50 short prints that combine to land one per pack. Parallels include Gold Sepia, Exclusives (#/199, #/99 for SP), High Gloss (#/25, #/10 for SP) and Printing Plates. Boxes deliver one numbered autographed patch card. Men's Patch Autos come with two levels of rarity. Tier One cards are numbered to 125 while Tier Two are numbered to 199. Women's Patch Autos also come with 199 numbered copies. There are also rare jumbo patch and multi-patch parallels. Other memorabilia cards have anywhere from one to four swatches. Among them are Men's Jersey (1:8 packs), Women's Jersey (1:24), Jumbo Swatch (#/99), Dual Jersey (1:48), Triple Jersey (1:96), and Quad Jersey (1:384 packs).On top of that, all jersey cards have even rarer Gold parallels. Like the autographed patch cards, Men's Autographs come in two tiers. Rarer Tier 1 cards fall 1:200 packs while Tier 2 cards are inserted 1:123 packs. Women's Autographs land 1:175 packs. With Flying Colors (#/10) combine a signature with a manufactured patch of the Canadian national flag. 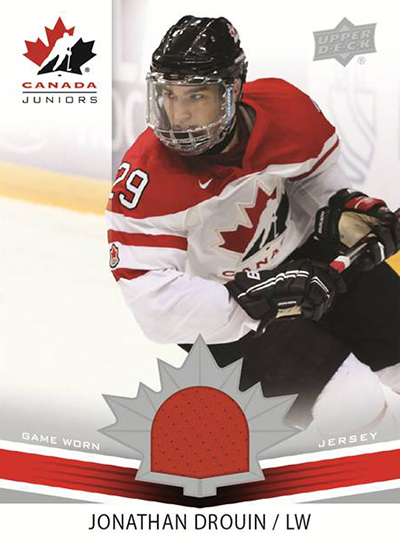 2014 Upper Deck Team Canada Juniors Hockey has a couple of basic insert sets as well. 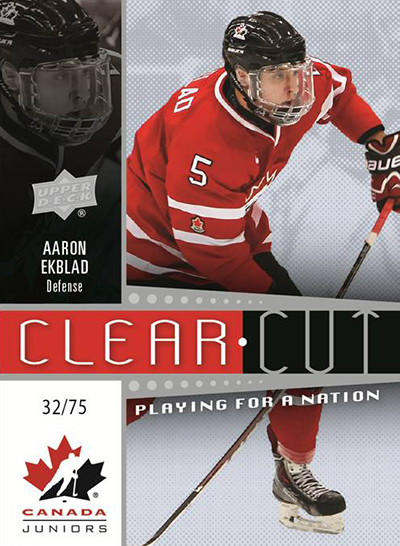 Clear Cut Playing for a Nation (#/75) is a die-cut acetate set. Combo cards are numbered to 25. The set is rounded out with Special Edition and Special Edition Gold. Like 2013 Upper Deck Team Canada Hockey, this product is exclusive to Canada. Please note images are mock-ups. Designs and content are subject to change. Good: Nice alternative to hockey prospecting, lots of autographs and memorabilia. Bad: Not much variety with designs, sticker autographs. The Bottom Line: Canadians take great pride in their international hockey. In millions of homes across the country, Boxing Day has become synonymous with the launch of the World Juniors. In the 1990s, players were well represented in several sets making for some memorable rookie cards well before their NHL debuts. Then the rules changed and players ha to make the NHL before getting their first cards. These might not be rookie cards, but for Canadians and hockey prospectors, 2014 Upper Deck Team Canada Juniors marks a solid return. Offering looks at both the men’s and women’s teams, the set has lots of players and tons of hits. It’s not the most high-end of releases, but it doesn’t need to be. It’s about the players. The 2014 Upper Deck Team Canada Juniors Hockey base set is very clean. Plenty of white space compliments the red and white national team jerseys very nicely. The foil accents and nameplate add a touch of elegance. While the backs forgo bios, it is nice to see international stats, something that likely won’t make their way onto many cards. The majority of the autographs and memorabilia cards are essentially parallels, taking on the same design elements. It works nicely for the jersey cards as they replace the logo from the base card design. Unfortunately, autographs are stickers. While I prefer not to have them at all, they can be acceptable if they’re integrated into the design. Here it looks more like an addition and takes away from their appeal. Special Edition and Clear Cut are the other basic inserts. Both have familiar elements as they’re names that are likely familiar to a lot of hockey card collectors from other Upper Deck sets. Special Edition is done on foil while Clear Cut is on acetate. Both are solid but not spectacular. I love the fact that the set covers both the men’s and women’s teams. It gives the set added depth and the ladies more well-deserved recognition. And while the players in the set are great, the set composition makes it tough to complete. Not only does Upper Deck have the traditional short prints, but the jersey cards are also numbered as part of the main set. The result is 100 base cards and 107 short prints. While they’re arranged in a way that collectors can easily focus on the base set or the regular short prints, there is a set-building mentality built into the checklist that can work both ways. For me, the jerseys are a little much. The autograph checklist is deep, encompassing most of the players in the base set. They’re aren’t a lot of household names now, but as far as covering the latest Junior squads, it’s excellent. For fans of Canada’s World Junior squads, this set delivers quite a lot. A lot of the content outside of top prospects like Connor McDavid might not be lighting the hobby on fire. Even still boxes are still very reasonable considering they have six total hits including an autographed patch and a multi-swatch card. On top of that, there’s definite long-term prospecting appeal where some of today’s cheap players could blossom in solid NHLers in the years ahead. Being a Canadian, I’ll admit that I’m probably a little biased when it comes to seeing Team Canada hockey cards. Even still, this is a solid set that fills a void in the hobby that’s been around about as long as the Stanley Cup was last won by a Canadian franchise. It’s due. By offering a deep mix of both the men’s and women’s teams, it sheds some hobby light of the Canadian hockey now and the future of the NHL. While I’d really like to see better use of the autographs with either on-card signatures or a separate design that integrates the stickers, there are a lot of other enticing elements that still make this an enjoyable break — especially for Canadians. For $100, this is a flat out great product. I opened 4 boxes and felt I received real value insofar as the parallels and inserts are concerned. 3 of the 4 boxes I busted had even more hits than the 6 promised. The only downside for me is the women’s hockey–not a huge fan myself, and would rather the hits focus strictly on the men’s juniors. All in all a fun product to open before the 2015 season kicks off and there are some real gems to be had (McDavid, Drouin, Ekblad, Barzal, Konecy, etc.). On a recent visit to Ontario. .me and my son bought 2 boxes. .we pulled the Hayley wickenheiser printing plate ..one of one. .!! Great stuff..